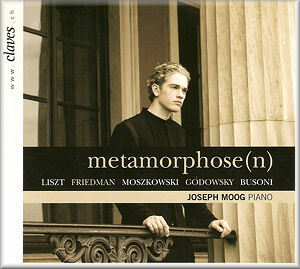 Claves continues its commitment to the young Joseph Moog, who recorded the Liszt concertos for the company, with a solo recital of uncompromising grandeur. It’s one moreover that wears a stylish Old School patina evoking titans of old, executant-composers of unimpeachable virtuosity and élan. It’s not a programme that many pianists these days would espouse and its demands, both digital and colouristic, are pretty much incessant. It’s clearly not much of a cerebral recital either, offering little in the way of real meat but in compensation a great deal of purely pianistic panache. There’s no doubting the powerful conveyance of Liszt’s Réminiscences de Norma in which seventeen minutes are expended on the vocalised drolleries of the composer’s imaginative recasting of material. For all the leonine interpretive stance however, some might prefer the younger Brendel’s more taut rhetoric in his performance currently housed in Brilliant 73786. The three Godowsky items leave a mixed impression. The composer himself left behind a c.1935 private recording of The Gardens of Buitenzorg from the Java Suite - it’s on Marston though not definitively by the composer. Of other contemporary Klaviertigers Stephen Hough has done likewise on a disc for Nimbus which I am shortly to review. In both cases Moog’s performance is outclassed. Voicings are diffuse and the performance is over-languorous, the response too lateral. Similarly, though Moog is a player of highly auspicious technical accomplishment his reading of Godowsky’s reworking of The Swan is merely competent. After hearing Cherkassky’s glorious poetry and delicacy here (FHR04) this new entrant cannot help but sound prosaic. These factors tend to affect the programme as a whole. The playing is assured but the animating spirit, the sense of colour, fantasy and rhythmic vitality curiously absent, as if he has donned a cloak but feels awkward wearing it. It’s this multi faceted lack that limits appreciation of something like Friedman’s Voices of Spring, a Straussian confection well suited to that great virtuoso. Moog doesn’t pummel it, nor does he underplay it; what’s missing is bravado, a sense of real humour, a delight in its caprice. The Busoni Carmen fantasy is engaging, though could do with a little more sense of projection. And to end with the Moszkowski Tannhäuser paraphrase is to risk a lot; largely he succeeds. The recital is audacious and well recorded. I didn’t however feel that Moog is deeply entrenched in the particular stylistic particularities of every piece. More of a sense of fantasy, colour and animation is required.